I studied at Winchester School of Art for my BA, and then at Kingston University where I obtained an MA in Applied Fine Art. I now live and work near Woking in Surrey. My inspiration comes from life itself, and my favourite subjects are wildlife and people. Recently I have been fascinated with people in an urban environment. I am fortunate living so close to a big city where it is easy to observe and photograph people going about their daily lives. 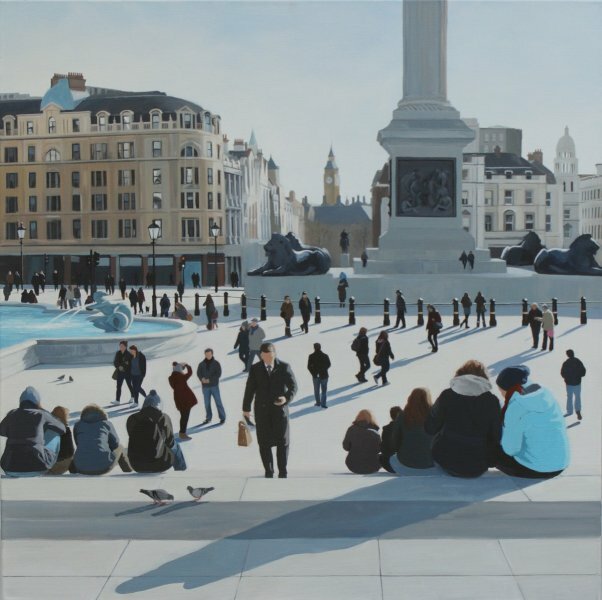 I particularly like places which are busy and where people congregate, as a result my paintings have become increasingly busy. I aim to create work that is ambitious in scale and complexity and that encourages the viewer to take a closer look and get involved in the many characters. My many influences include the work of Pissarro, Hopper and Lowry. I work in a variety of media but particularly like acrylic for its speed and flexibility. I exhibit my paintings regularly and have been fortunate to have won several prizes over recent years. I have also been shortlisted for several major prizes including BBC Wildlife Artist of the Year 2011, Surrey Artist of the Year 2011, and Artist and Illustrators Artist of the Year 2013 and 2014.